Clinically proven to inhibit harmful microorganisms associated with gingivitis and oral irritations. Promotes healing of bleeding gums and inflammation. Fights both the causes and effects of Halitosis (bad breath). Especially helpful for the bedridden patient or the handicapped who may have difficulties maintaining good oral hygiene. The SLS Free formula is extra gentle to dry tissues and prevents canker sores and ulcers. Biotene is the only toothpaste in the world that works like the body’s natural defenses to fight cavities, periodontal disease and oral infections due to Dry Mouth. Biotène contains three primary enzymes – Glucose Oxidase, Lactoperoxidase, and Lysozyme, which are carefully balanced for a special function in boosting and replenishing saliva’s own defenses. When used daily, Biotène reduces harmful bacteria, but leaves beneficial bacteria necessary for healthy teeth and oral tissues. Use in place of your regular toothpaste. Rinse toothbrush in water before applying Biotène. Brush for two minutes, rinse lightly. For best results, use first thing in the morning, after eating, and at bedtime. It is important not to skip brushing because the enzymes in Biotène can fully help give your mouth a healthy balance of bacteria. Recent reports suggest that some people get fewer canker sores when they switch to a toothpaste that doesn’t contain sodium lauryl sulfate (SLS). Researchers speculate that SLS dries out the protective mucous lining in the mouth…making it vulnerable to irritants that lead to canker sores. SLS is a detergent that is in almost all toothpastes, dishwashing soaps and body washes. Adults & children prone to canker sores should try an SLS-free toothpaste. The Mouth’s naturally occurring protective system comes from three pairs of salivary glands. When, for any reason, the amount of saliva is disrupted, this important antibacterial defense system is lost. Only Biotène patented salivary enzyme products are capable of protecting the mouth the same way in which saliva does! The doctor or dentist might suggest which products to use depending upon what is causing Dry Mouth. When should I see positive results from Biotène Toothpaste? You should see results immediately – depending on the severity of your dry mouth condition it may take up to ten days. 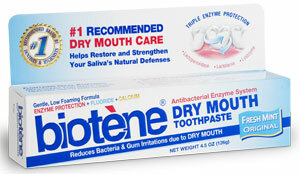 Can anyone use Biotène Toothpaste, even if they don’t have Dry Mouth? Absolutely. Biotène’s natural enzymes are normally found in saliva and are essential in preventing cavities and gingivitis while promoting a healthy oral flora. Why doesn’t Biotène foam up like other toothpaste? Unlike most other toothpastes, Biotène is made extra gentle and without Sodium Lauryl Sulfate, a harsh detergent, which can cause canker sores. Biotène Toothpaste contains an ingredient called ‘Glucose Oxidase’. Is this a sugar? No, Glucose Oxidase is not a Sugar. It is an enzyme, which acts on the glucose (sugar) produced from food ingestion. This reaction helps to eliminate glucose from the mouth. Do I have to rinse after using Biotène Toothpaste? Yes. However, unlike other toothpaste, you need only rinse once after using Biotène. Biotène does contain fluoride, which is not recommended to swallow. What Flavor is the Biotène Toothpaste? Biotène Toothpaste is flavored with Natural Wintergreen Mint. Does the Biotène Toothpaste contain fluoride? Yes, biotène contains Sodium Monoflurophosphate. Can I use the Biotène toothpaste with another mouthwash or another toothpaste other than Biotène?